The Ang Ku and Pigeon pieces at the Soi RommaneeThalang Rd intersection. Photo: Dan Miles. The food themes on the murals are not coincidental, inspired by Phuket’s inclusion in Unesco Creative Cities listing for its gastronomic delights. 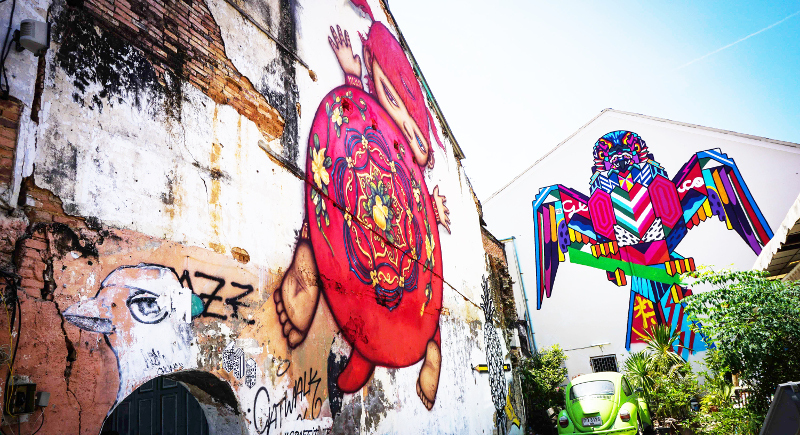 Wirachai believes there is a need to build up on the accolade – through a book focused on conserving Phuket’s gastronomical heritage, and the street murals are a first step to that. Each of the 12 street art images represents one of the 12 chapters in the yet-to-be published book on Phuket’s culinary heritage. 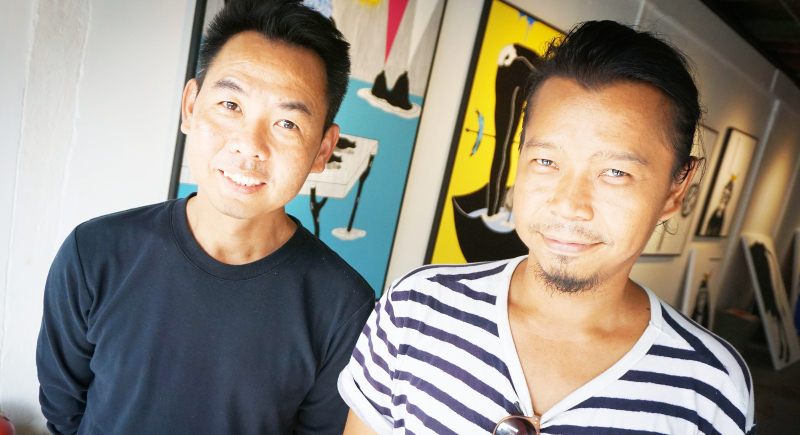 Wirachai is the finance and direction behind the murals. In providing financial support for the project, which has received no budget from the Tourism Authority or the Phuket City Municipality, Wirachai paid for the materials and equipment used to create the works of art and for the flights and accommodation for the artists, who are providing their skills for free. Formerly a professional architect and currently a hotelier, Wirachai makes for the consummate organiser for the “So Phuket” project, bringing together a community of people who love Phuket culture and want to preserve it. More than anything, he and his collaborators have created space for artists such as Zen to be able to create within, drawing in artists and admirers alike to benefit in a myriad of ways while he puts together symbolism, conformity and heritage for means to provide aesthetics and food for thought in Old Town. Zen, his given name of Danai Usama long forgotten, is a local artist and sculptor from Phuket and has spent the last decade exhibiting all over Europe. The street art project in Phuket has already stirred up undue attention with the bureaucratic kerfuffle behind the mural by Bangkok artist Pattcharapon ‘Alex Face’ Tangreun on the historic Standard Chartered Building, attention that Zen sees as a positive force in spreading exposure and awareness of art in Phuket, where the vast majority of people are either uninterested or do not go out of their way to visit galleries and attend exhibitions. For Zen, the most important feature is the ability to get his art out, to affect as many people as possible, and to make art a part of their everyday awareness. He points out that even Krabi has contemporary art museums, something that is starkly missing in Phuket, despite the prolific number of artists who have turned out to take part in the massive project of 12 murals, of which he has painted four in conjunction with fellow artists. Despite the social media popularity of the street murals created under the project, the outrage created by Alex Face’s “Mardi” mural being painted on a historical building indicates a reservation, and perhaps even outright disdain for street art, likely indicates that Zen is not incorrect when he alludes to a lack of artistic appreciation and interest in Phuket. “Street art has a negative perception – ‘bad boys’ who spray paint. People do not know about the artistry involved in making street art happen,” he says. Zen and his friends draw an interesting, and rather apt comparison. “Tattoos were seen negatively as well. Over time, as more people got tattoos and people saw them more, the reaction changed from outright disgust to an interest in the individual tattoos reacting to the imagery. It has become about reactions to the tattoo itself instead of dismissing tattoos because of social stigma,” Zen notes. Given the upsurge of street art in Bangkok over the past five years, Zen’s efforts are likely to come to fruition. Of the current 12 murals underway, Zen has worked on four with fellow artists. Street art has its own special magic for creators like Zen – it takes two to three hours, sometimes an entire night, to put a mural together and he enjoys the impact it has. “People in Phuket wake up to a mural and find it stunning,” he says. 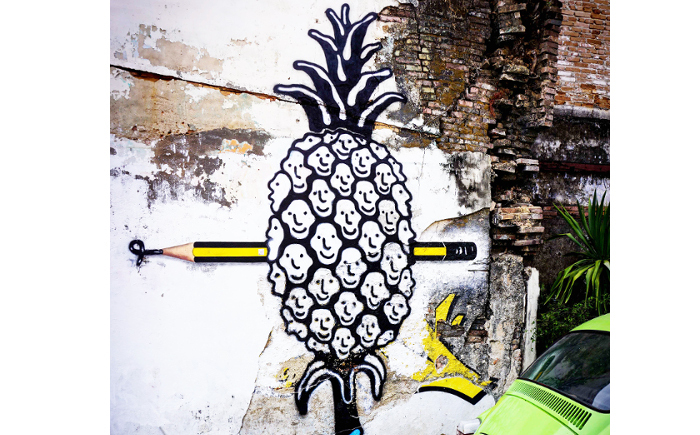 Zen and his fellow artists have an acute understanding of exposure and how daily contact with the murals, coupled with the sheer numbers and media exposure, are likely to create an indelible impression on Phuket residents, and not just the artist community. Thanks to Watcharin “Khun Nui” Rodnit for acting as translator for this article, and Dan Miles for photographs.